The Deep End Mod features 3 new Dimensions, and Biomes to match! each Dimension is deeper in the code, with 3 bosses guarding each one. 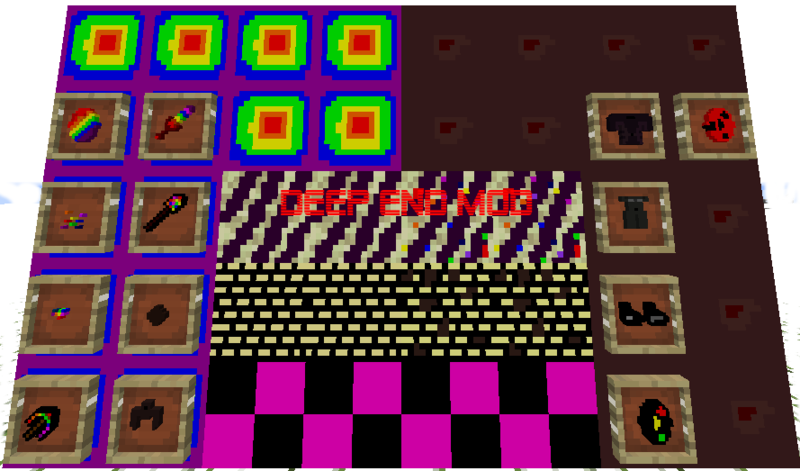 2 of the 3 dimensions have different ores, the Deep Ore makes tools stronger then Diamond, and the Dark Ore makes Armour. The problems that I am having which I would really appreicate people telling me how to fix is that I can't keep one boss per dimension, even when I set the max mobs to 1. The other one is that I don't know how to get the music to play outside of the ambient portal noise. EDIT 2: Feel free to suggest anything! already assing something new! in creative: get the End Stone, then go to the Tools Tab of the inventory. Get a Code Snippet. Make a portal like a Nether Portal and light it with the Snippet. It will take you to the Deep End. The Deep End has 2 new blocks, Deep Stone, and Deep Ore. Deep Stone is just a filler block, and Deep Ore drops Deep Powder, arrange 4 in a square with the Crafting Bench and you will get a Deep Gem. With the Deep Gems you can make a Deep Gem Block, or make a Pickaxe, Shovel, and Sword. Axes will come in the future. You will find one mob in the Deep End. The Dao. Dao is Notch with a black head. the black head was unintentional but I decided to leave it in. It is reccommended that you use a Deep Sword to take it out. If you make a portal with Deep Stone, found in the Deep End Mod tab and a Deep Code Snippet, in the tools tab, you will get the Dark End portal. In the Dark End, there are, once again, 2 new blocks. You will Find Dark Stone and Dark Ore. Dark Stone is just a filler, and Dark Ore drops Dark Jewels. Dark Jewels can craft armour. You will find almost every mob here except for the EnderDragon, MagmaCubes (Because MCreator misspelled them in teh Code) and the Wither (And Dao). There is also a new boss. it is Herobrine. He is stronger then Dao, and it is reccommended to have at least 1 piece of Dark Armour to kill him. It is worth noting that Grass is colored differently in these dimensions, and water is present in these as well. I will leave you to see all the secrets like that. Make a portal with Dark Stone and a Dark Code Snippet, you will get a portal to the Final Level. Oblivion. This one only has one mob and one new block. The New boss is Purge, and it is REQUIRED to have full Dark Armour and a Deep Sword to get him. he does insane damage and has high health. The new block is the Oblivion Glitch. In survival, it is much of the same, but you get the Code Snippet by smelting the dragon Egg, and you get the different Code Snippets by smelting the last one. This is my very first mod so it isnt very great. I will keep updating it, and would like to know how to put in Music for each dimension.